June rolled in with very little sign that spring had even arrived, let alone that summer was a mere 20 days away. The water from up inside the bays, out along the coast, and offshore to the continental shelf was well below normal, in some cases 10 to 15 degrees below the norm. The bait was stacked thick as a result of the cold water, however that was about all that was happy in the frigid depths surrounding southern New England. The whale and dolphin show was worth the price of admission, but the bluefin were very slow to materialize. When they did show themselves, it was briefly and the sizes of these early season brutes much too large for the light tackle gear we employ. The larger fish of 800 plus pounds can tolerate much colder waters than their smaller brethren, so we were forced to beef up our gear and hope to connect with one of the "smaller" giants of 300-500 pounds that were mixed in. There were several heartbreaking, grueling fights from the bow of the Dusky through mid month, all of them ended in failure. 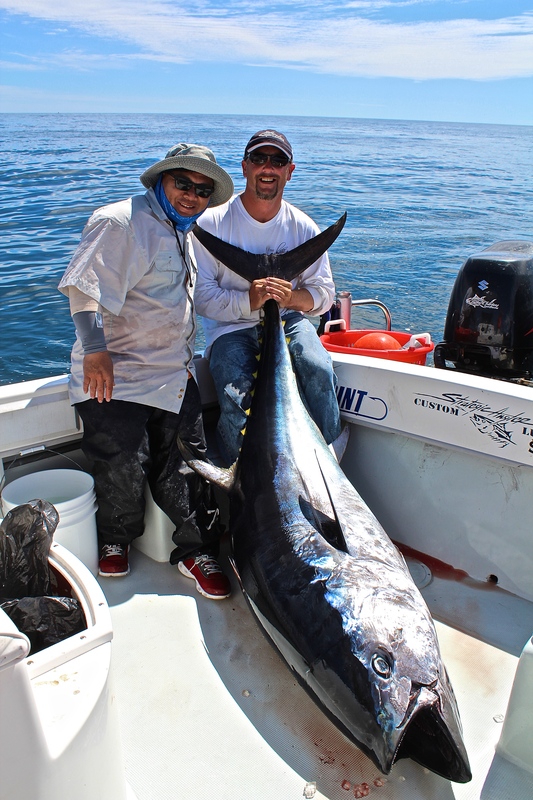 Mid month saw much of the same weather, but a group from Singapore finally got the proverbial albatross off our neck, scoring the season's first bluefin on top water. After a brutal fight, the fish of a lifetime was brought alongside and hoisted into the Dusky. The trophy fish measured 84 inches in length, and weighed in at 300 plus pounds, an amazing feat on light tackle using freestyle methods! 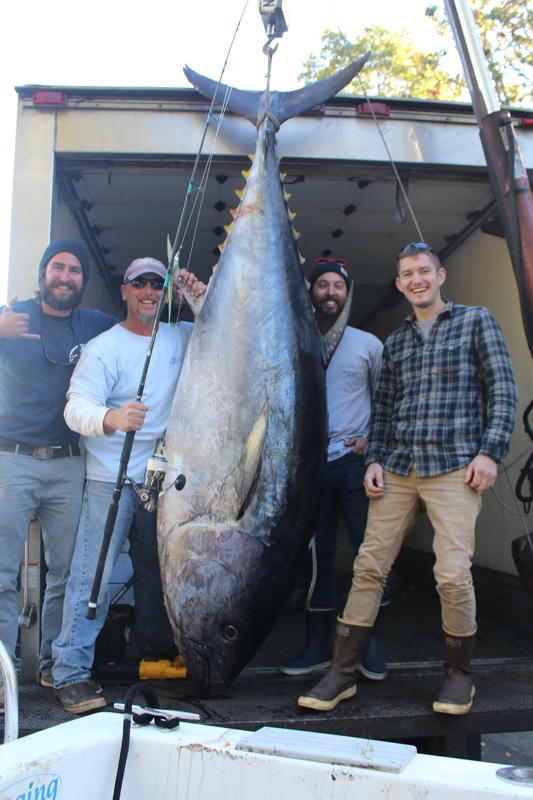 Making happy memories is what we live for here at Coastal Charters Sportfishing, and thankfully the fishery off southern New England although it can be slow, still is the best place on earth to target bluefin tuna using light tackle methods! After a long, brutally cold winter, we finally got the cover off the Dusky and all the systems online and ready for the year to come. The first month is always kicked off with the annual squid run. Typically cold winters yield a good squid run, and after several seasons of slow to non-existent runs, we were rewarded with the best squid run seen here in New England in many years. The bite takes place in shallow, nearshore waters, when the squid move in from offshore areas to spawn. We target them using ultra light spinning set ups armed with two micro sized squid jigs, where the action ranges from fast and furious to a slow, touchy bite where finesse and skill are required to score good numbers. They are a bunch of fun to catch, and make excellent baits for many different species later on the year, as well as incredible table fare with the freshly caught tubes. They do quite squirt a bit of ink around, but there are a few tricks we employ here at Coastal Charters Sportfishing that help clean the Dusky up good as new with minimal effort! This seasons run was fantastic, lasting two solid weeks and giving way only when the striped bass and bluefish showed up to terrorize them. The bass run this spring was another good one, giving hope that this would also equal good tuna run. 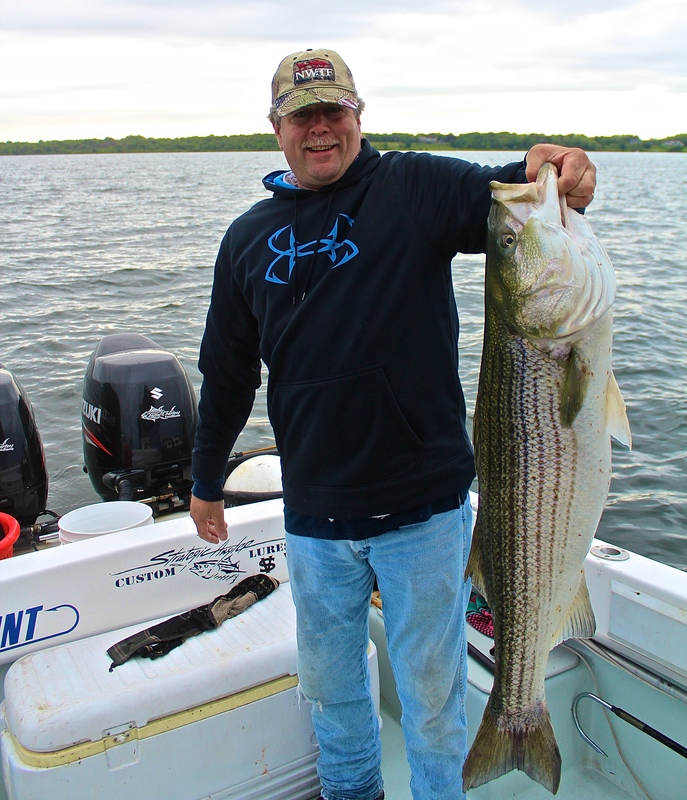 However, the weather had other plans, and the cold, rainy end to May prevented any pre season runs for tuna, keeping the Dusky inside to throw top water plugs and drop jigs to striped bass. These inshore game fish are always fun to target on light tackle, mostly catch and release, although a few make it to the dinner table or the smoker. The month finished up just as it started, with no rise in temps of the water or signs of the cold snap breaking.